Creating a real estate related website? If you are a real estate agent, broker, an estate owner or a real estate agency and want to take your business online, here are few best real estate WordPress themes of 2018. Create real estate listing directories with user submissions or a simple real estate website for your brokerage company. 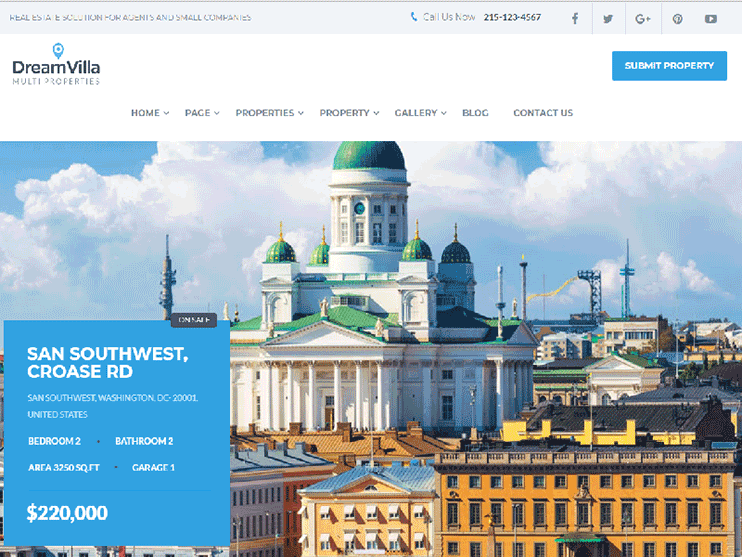 Also – Have a look at Templatic’s collection of Real estate WordPress themes and the real estate directory platform for realtors, agents, estate brokers, or real estate directory. Wondering how to create a real estate website With WordPress? Here the solution. Check out this FREE guide that demonstrates all the steps on how to create a property listing website using WordPress. BENAA is a professional WordPress theme designed for any real estate website with advanced management options and flexible, friendly frontend and backend features focused on usability that makes properties managements a breeze. Property submission is easy with the ready to use property submission form & supports Google maps with location markers for location-based features. There are many other useful features like user profile management, payment processing systems (supports PayPal, Wire Transfer and Stripe for payments and transactions), save searched, compare properties, add to favorites, adding floors, custom field management, etc. You can also attach the document with your property and print properties in the PDF file. The admin can manage all properties and users, uses options to allow users to submit their properties for free or a fee based on packages, transactions, invoices and so much more. This theme supports drag and drop page building with the included Visual Composer & supports VC shortcodes, header layouts, widgets and customization options to personalize your website as much as you want. 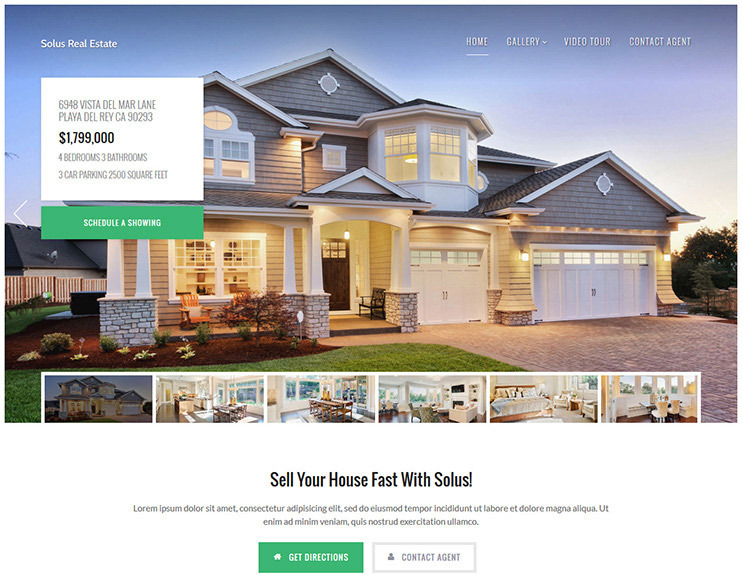 Create your real estate website fast and easy with the real estate v2 theme. 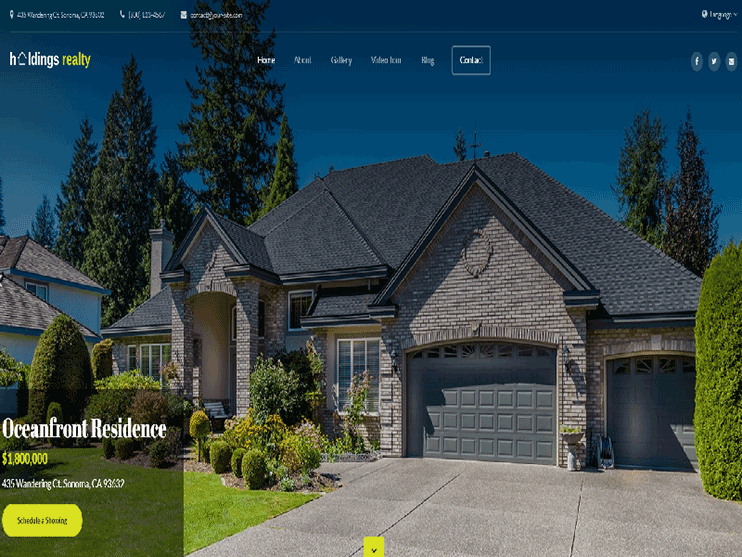 This theme is a standalone Real estate WordPress theme, that you can use to create simple real estate websites, or complex property listing directories. The real estate theme comes with a fully functional front end property submission system. Besides, there are ready to use property submission form, and payment processing systems. There are enough customization options to personalize your website as much as you want. 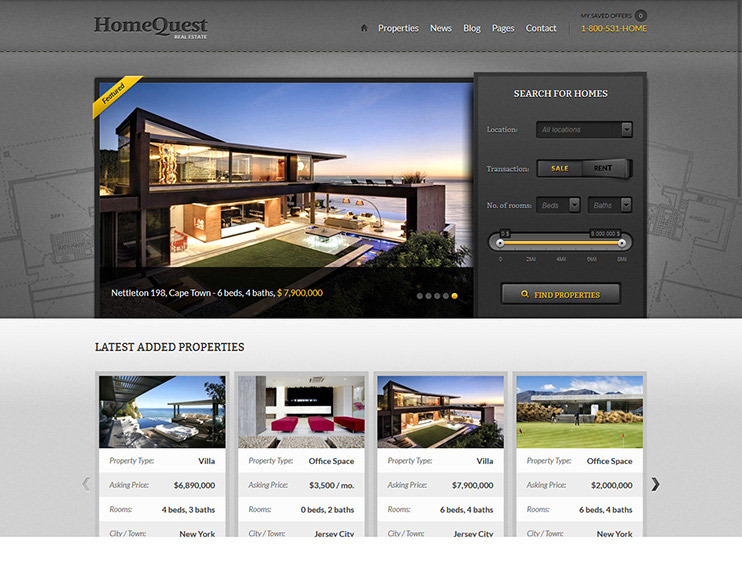 Use HomeQuest and Directory as a powerful real estate directory theme. This properties WordPress theme helps you create, manage and monetize a real estate classifieds portal. As well as this, you can also use HomeQuest for any other type of classifieds or online business directory for various businesses such as Cars, Hotels, Restaurants, Travel Destinations etc. The flexibility of this theme gives you endless options of what you can use it for. This is another one of our elegant child themes for our Directory Theme. The parent theme is included with the HomeQuest Standard or Developer license. Directory is where HomeQuest gets all of its power from. HomeQuest also includes our Real Estate plugin for all of its property classified features such as the property search functions and much more. Villa Rental theme is a powerful rental property management system. Ideal for online accommodation booking from desktop or mobile devices. Villa Rental is an advanced booking theme which can manage one or multiple properties. Powered by our Tevolution and Booking plugins which are both included, this theme is a very powerful property rentals system. 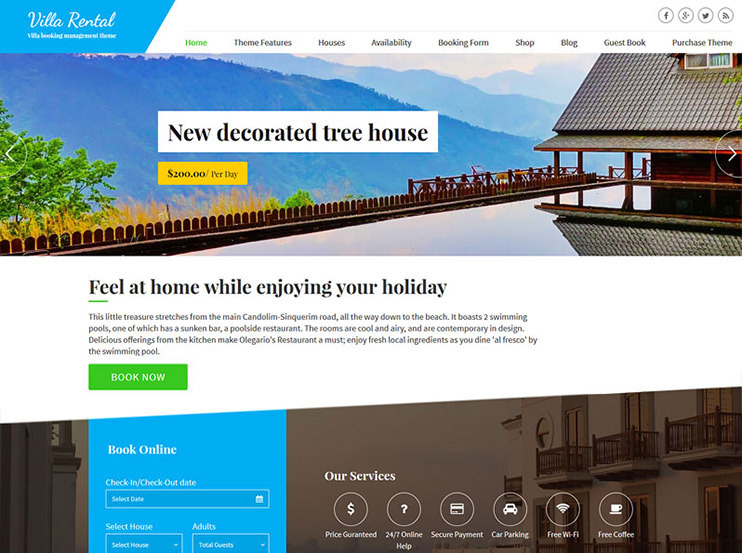 This theme can be used if you’re a villa/ holiday accommodation owner wishing to manage online lettings or if you are a realtor or real estate agency. The theme’s booking system can be used to manage bookings for one or thousands of rental properties, each gets its own prices and booking calendar. WP Residence is a WordPress real estate template to create great website in 2018. It is feature rich and flexible. 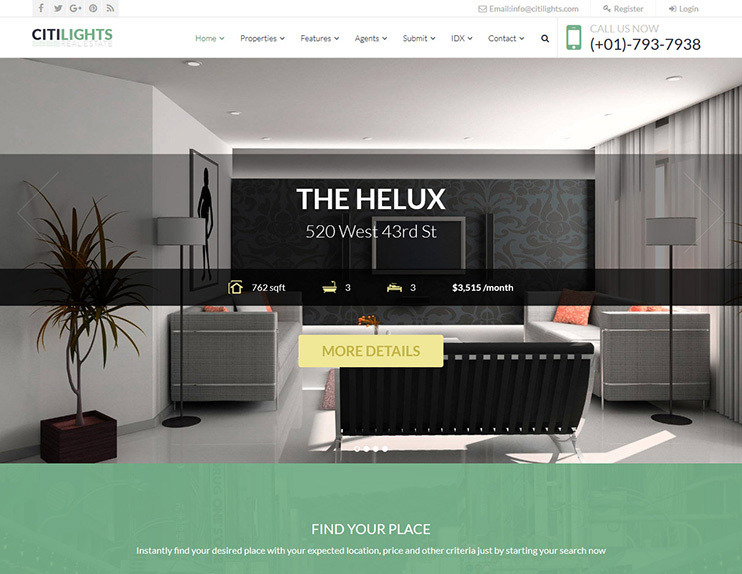 This theme is ideal for a feature rich and large real estate directory websites. You can create page designs of your choice with the drag and drop visual composer page builder. This theme supports PayPal and Stripe for payments and transactions. This theme has the advanced search feature and you can choose the fields for the search. The theme supports Google maps with location markers for location based features. It also allows front end property submission, adding floor plans, custom field management, geolocation features, etc. You can also attach pdf document with your property. It allows paid submission and membership. WP Estate is a real estate theme that is ideal for estate agents as well as general property listing websites. It is feature rich, flexible and comes with advanced management options. You can allow paid submissions in your website. The transactions are supported by the Stripe and PayPal. This theme also allows Social logins. 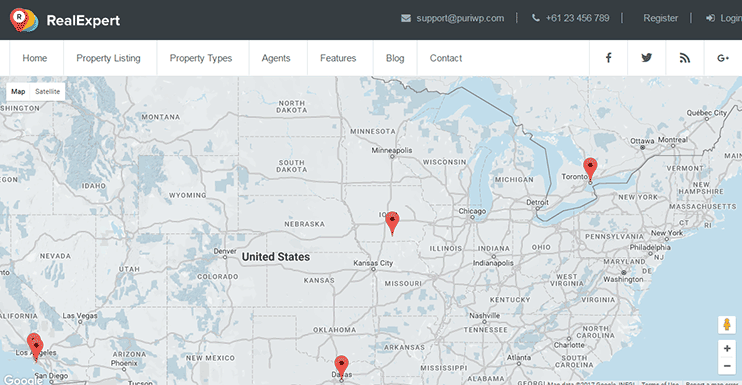 WP Estate allows you to turn on the Geolocation feature for location aware results. The fields for real estate listing forms can be easily customized. In addition, it has a booking system. WP estate is SEO optimized. 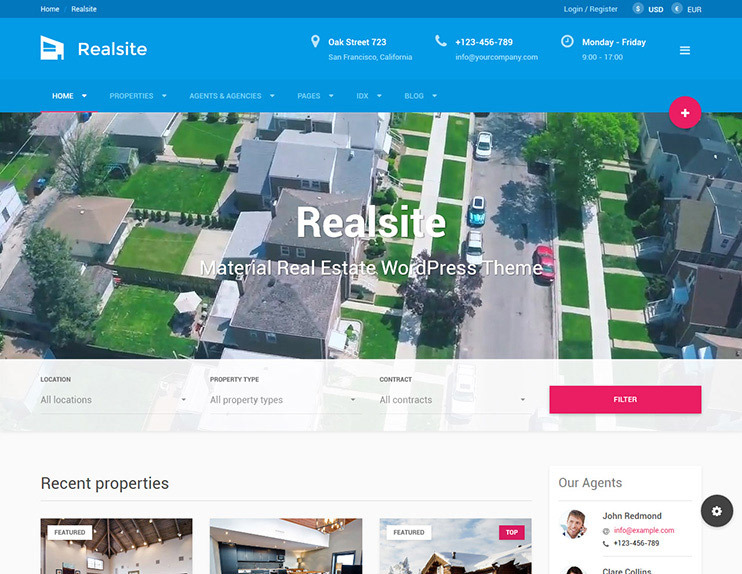 Reales WP is a real estate WordPress theme for a basic real estate website. It has all the features required for a full fledged Real estate website. You can create a website where agents register and submit their properties. It allows front end submission. You can monetize your website with the membership plans. For properties displayed in the website, there are many options. 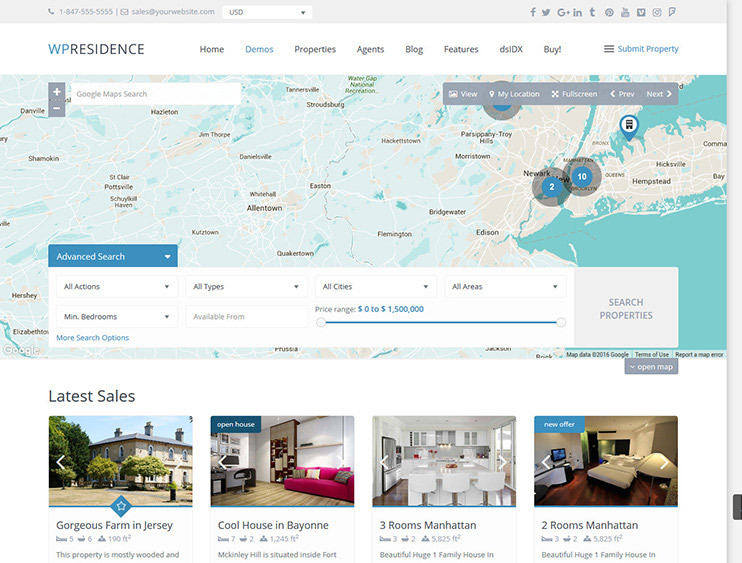 You can display your properties with all the details that your visitors would like to know. It also allows social logins with facebook and Google. It also comes with Google maps integration. Looking for one of the best real estate WordPress themes with forums support. Then Homeland is for you. It can let you create a full featured real estate website that supports group discussions of the registered users. Homeland has a beautiful design. It allows you to design pages of your website with the drag and drop Visual Composer. It is SEO ready. You can start user forums using the bbPress plugin. This theme allows the integration of Booking calendar plugin for property booking features. You can also create amazing portfolios. Homeland can be your best choice if you don't need the paid front end submission feature. 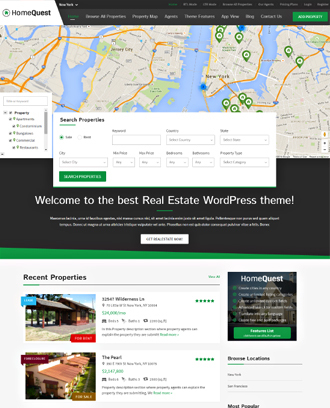 WP Pro Real Estate is one of the WordPress themes for real estate. It has a beautiful design and allows you customizations with the theme customizer. So, you can create a professional real estate website that supports your branding. WP Pro Real Estate allows Visual Composer for drag and drop page building. There are a few conceptual demo designs you can choose from. You can allow free or paid front end submissions. This theme has a refined invoice and billing system. It comes with PayPal integration for facilitating monetary transactions. It also allows adding floor plans and sublistings. It is SEO optimized. It has a booking system. 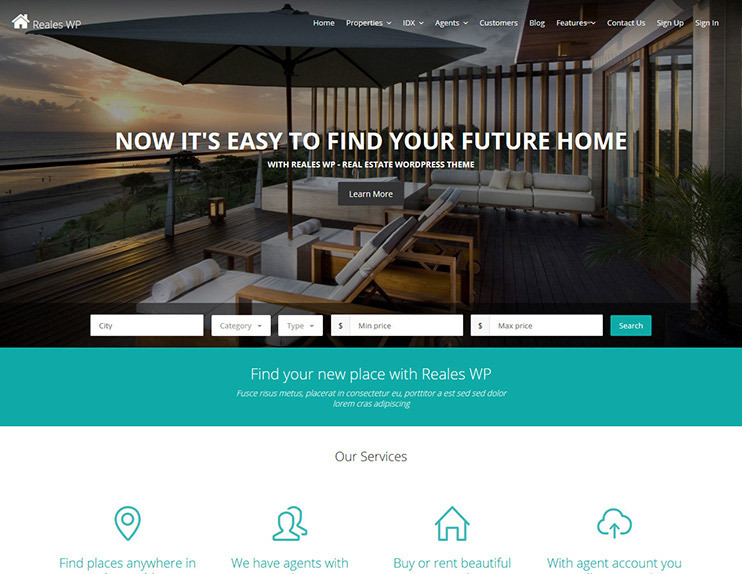 Real places is a real estate real estate agent wp theme. With this theme you can create a portal for real estates with the front end submission and profile management features. The theme comes with Visual composer compatibility. It has a design that fits its purpose. The theme comes with Google maps integration. Homepage of Real places can be managed with the drag and drop builder. There are 3 designs for property detail page. You can choose the one you like. It also allows floor plans, attaching pdfs with the properties and adding sub properties. The transactions are facilitated by the PayPal. CitiLights is a theme dedicated to real estate ads. It can be used to create property listing websites or for real estate agents and agencies in 2018. It is flexible and easy to use. The theme can be monetized the way you want. Create membership plans or let them pay per submission. The theme supports geolocation features. It allows front end property submission and agent profile management. This theme is highly customizable and comes with all the easy options to manage the website behaviour. WP pro real estate 6 is one of the real estate broker WordPress themes. It can be used for real estate business, rental services, etc. It is beautiful and feature packed. You can change how the homepage looks with the drag and drop homepage builder. It supports front end submission system. Payments are processed with the PayPal payment gateway. With extremely easy options you can decide how you want your theme to look. It is SEO optimized. 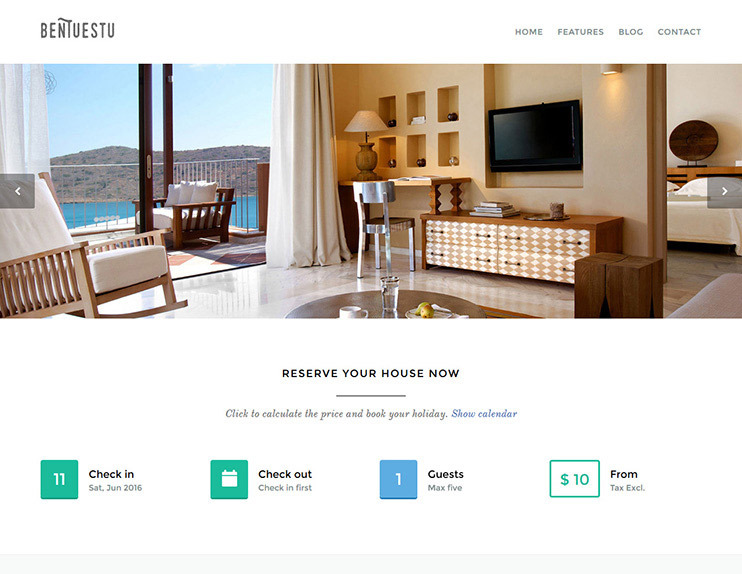 Bentuestu is a property management theme. Basically, you can use this theme to show the rental properties. The theme does not come with the feature of front end submission. So, the basic concept of the theme is to let you display the rental properties. They can be rental villas, guest houses, or rooms. The theme comes with the booking calendar. So, your visitors can book online using your website. It also features an availability checker for the visitors convenience. WP Rentals is one of the templates for realtors for listing in 2018. The theme is ideal for creating website for displaying places and allow booking for theme. WP Rentals comes with Google map integration. You can create pages with drag and drop Visual Composer page builder. For accepting payments, you can use the stripe and PayPal payment gateway. It allows you to set pricing plans for a specific time period. This theme allows multiple currencies. It has the features for front end registration, submission and profile management. 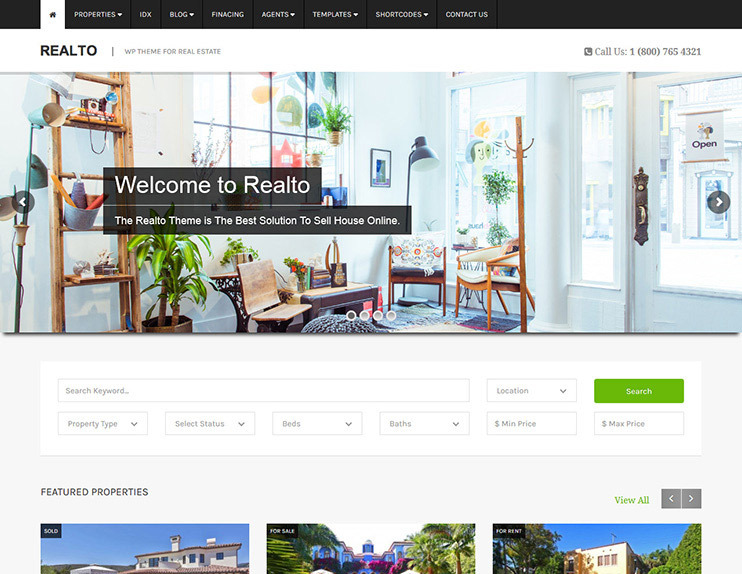 Realto one of the simple and beautiful real estate agent website templates. It has a clean and modern design. Realto allows you to add properties with the properties post type. You can use the Visual Composer page builder for page building. This theme comes with Admin panel options to easily control the website appearance. It is SEO optimized. Zoner is an feature rich real estate ads theme. It is SEO and eolocation ready theme for creating amazing real estate listing websites. You can choose from the 15 homepage layouts. It allows you to use the Google maps or the open street maps. Zoner allows easy page creation with the drag and drop Visual Composer page builder. For front end submission, you can allow Membership plans and payment per submission. PayPal and Stripe are supported for transactions. It allows social logins through Facebook and google plus. Besides, there are many more features that Zoner provides. 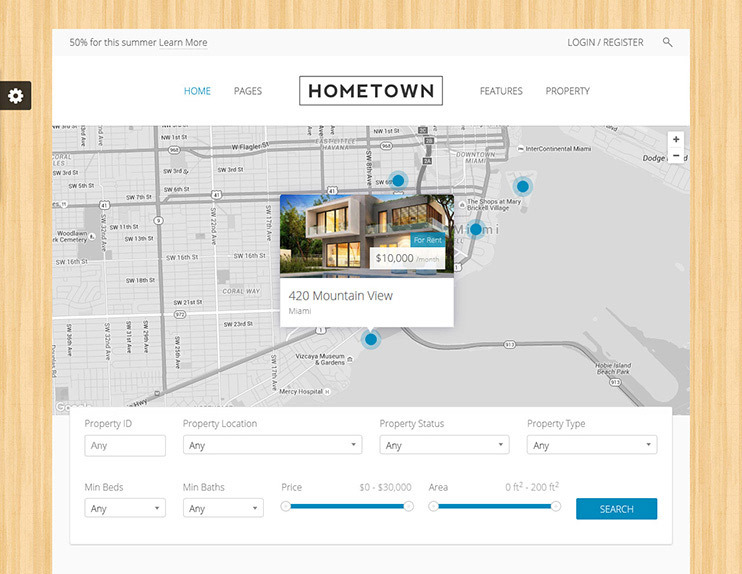 Hometown is property management wp theme. It is a straightforward and easy to use theme. It supports a wide range of functionalities to create a full fledged real estate website. 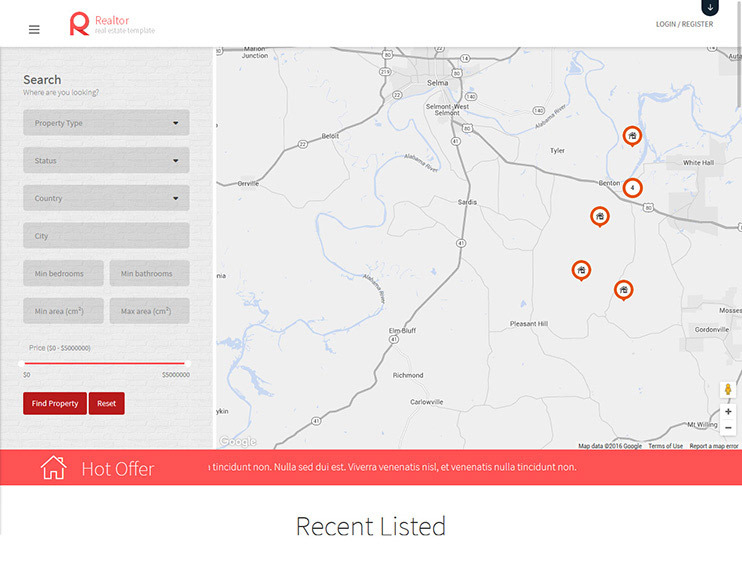 Hometown has a well designed and full-functional property search form. You can create pages with drag and drop options using Visual Composer. 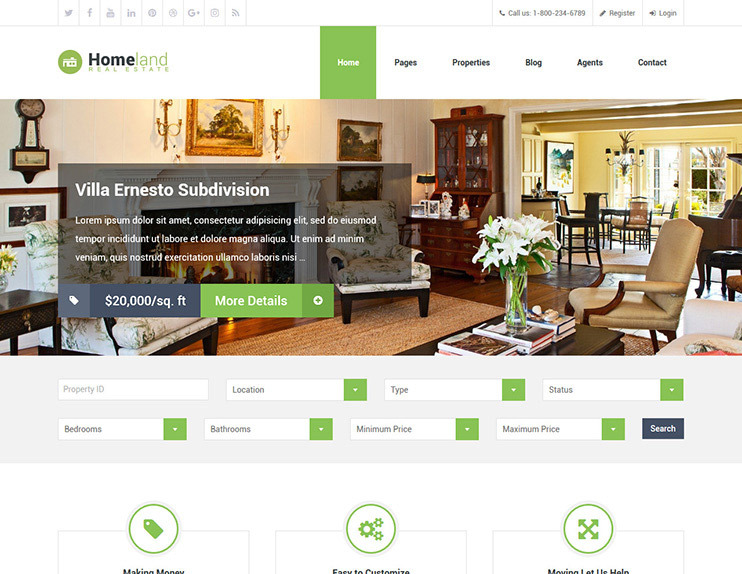 The theme allows front end property submission and editing. It allows PayPal integration. Hometown comes with other features such as property comparison, add as favourite. The theme is SEO and performance optimized. Real Spaces is a property management theme and you can create a sober Real estate listing website in 2018. 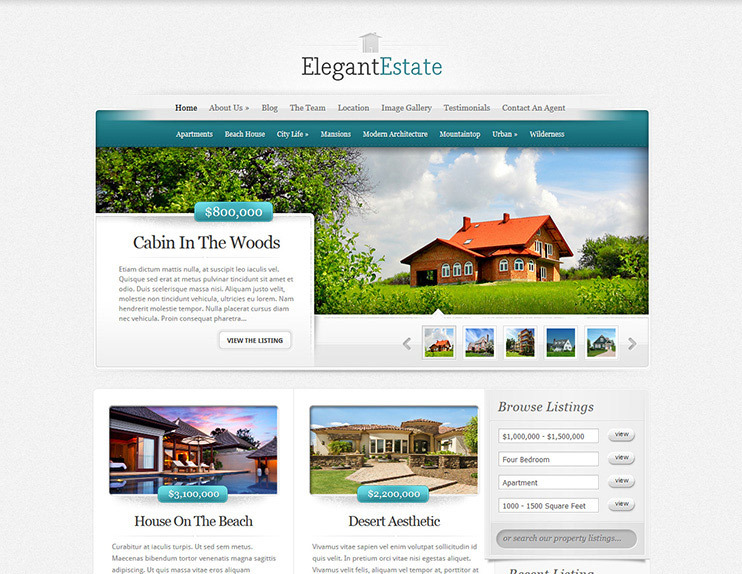 With this theme you can create a fully featured WordPress website with real estates. It has a clean and modern design. 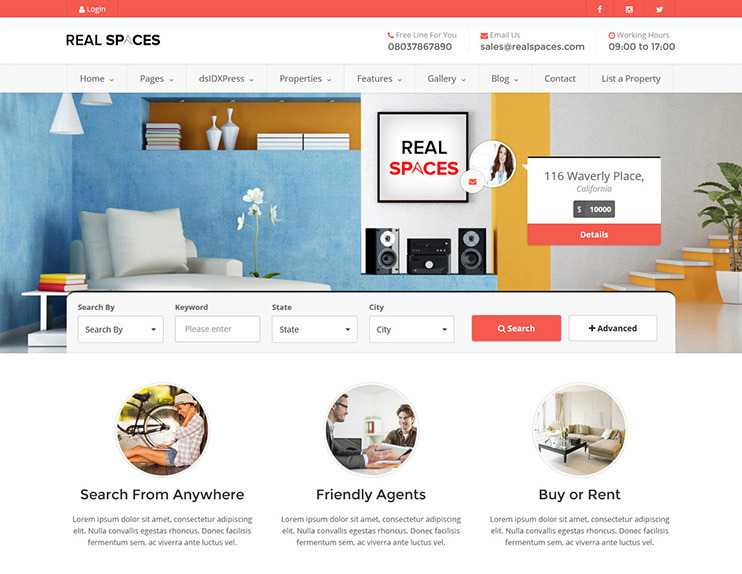 With Real Spaces you can create website that lets agents register online for property submission. You can allow paid property listing in your website with the PayPal support. Real Spaces allows you to save your search for future reference and also add it as a favourite or compare properties. Real spaces is SEO optimized. 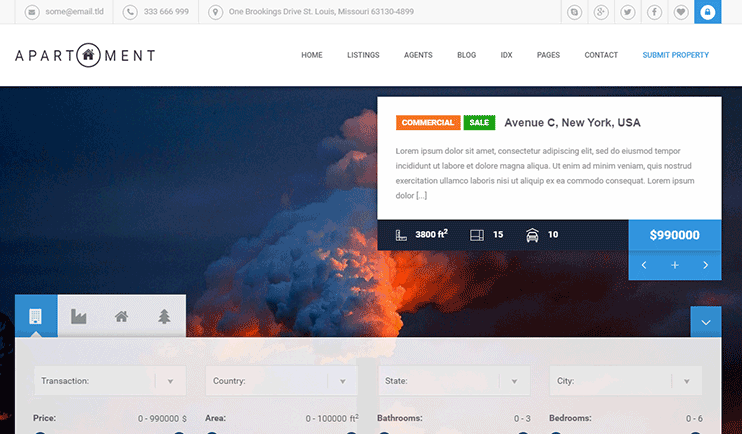 If you want to create a website for a single property and not a real estate listing directory template, Solus is for you. It is a perfect theme to promote/advertise your home, apartment or any such accomodation place. Solus is easy to use and flexible. The theme can be easily customized using the intuitive options. The full screen header image can highlight the image of your house. It also has with a pre designed contact form. You can add images, videos and text of your property. Properta is a minimally designed and feature rich WordPress theme. It is easy to use and comes with all the features required to create a property portal. Properta has PayPal integrated. The theme comes with advanced filters, front end submission and property management features. You can also use various monetization features of this theme to make money. It allows you to add and allow front end submission of location based property listings. The theme allows integration of the realia plugin. 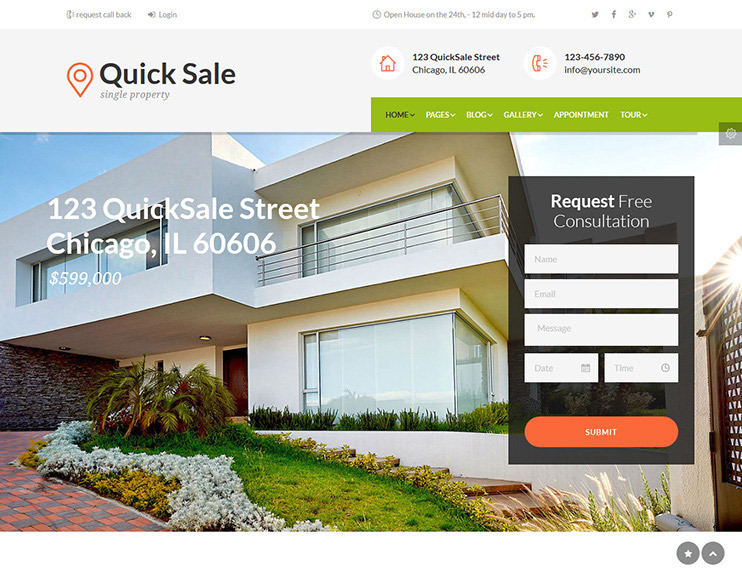 Quick Sale is a single property website. This theme comes with easy and abundant customization options. You can use Quick Sale for creating a website that showcases your apartment or any real estate. Quick Sale allows Visual Composer for quick page building. The theme comes with a booking system. With the Events calendar plugin you can show events on your website. For displaying images, you can choose your gallery style. You can also use WooCommerce with this theme for ecommerce features. It is SEO ready too. 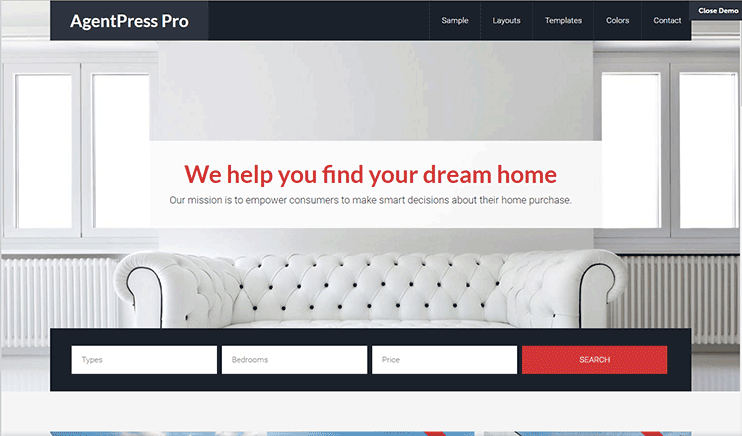 WP pro real estate 5 is a multipurpose real estate WordPress theme. It is feature rich and easy to use. It comes with demos for multipage, vacation rental and landing page websites. You can easily customize the theme using the theme customizer. The homepage can be created using the drag and drop homepage manager. The inbuilt page builder lets you create pages of your choice. The added listing can be managed very easily. It has built in dsIDXpress support. WP Pro real estate 5 is SEO optimized. 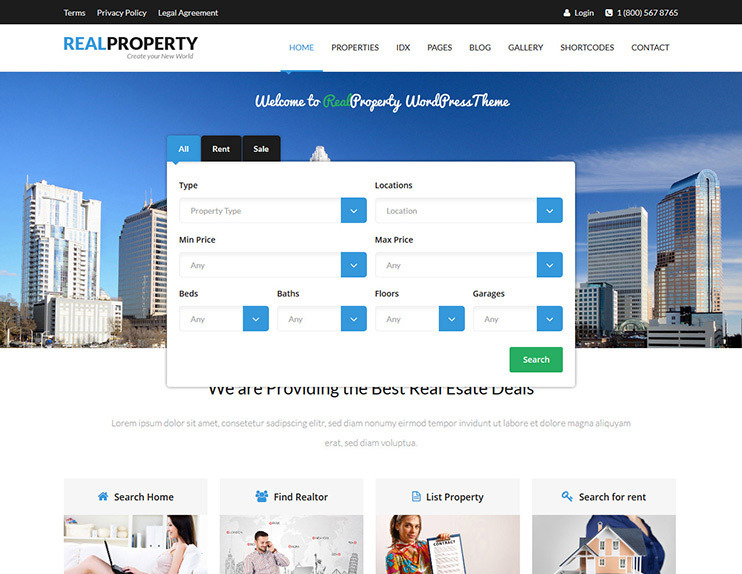 Real property is a feature rich property management theme. With this theme you can create a portal where agents and users post their properties while the visitors search properties. Choose from the 4 homepage layouts. It has abundant customization options. You can make it look the way you want. The theme has the feature for Advanced search, front end property submission and editing. The theme comes with an amazing inbuilt page builder to create pages. Besides, you can add image galleries and videos. 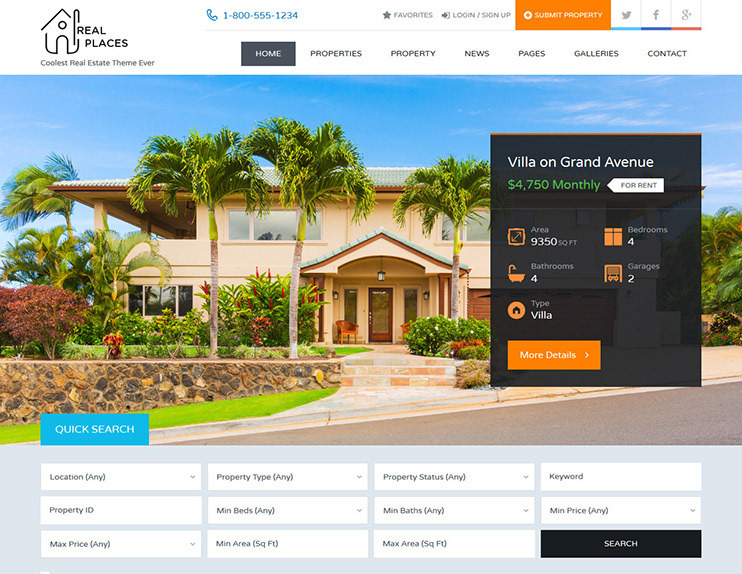 Real Site is a beautifully designed and feature rich property management theme. It comes with handy customization options using which you can make your website look and behave the way you want. Real sites allows beautiful property listing and front end submission. The theme is SEO friendly. It supports multiple currencies and property comparison. The theme comes with integrated PayPal for financial transactions. Real site has many monetization options. Villa Real estate agents listing theme. 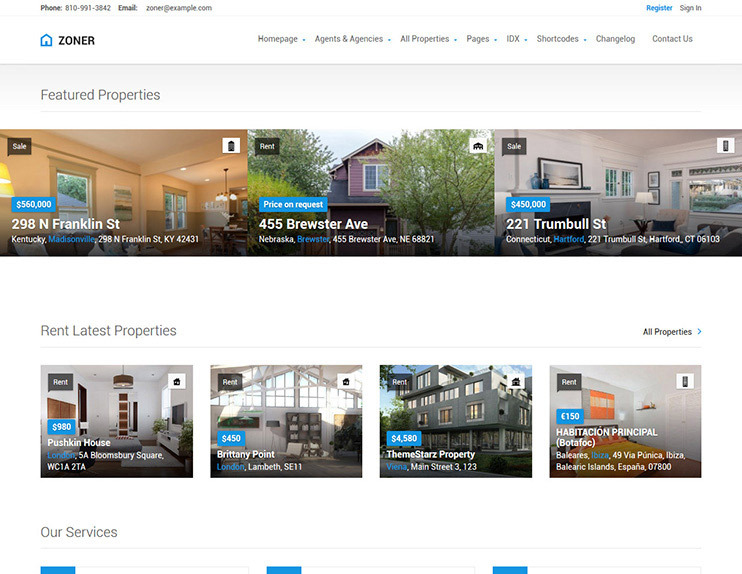 The theme allows front end submission and monetization options to let you create a portal of real estate listings. With Villa Real you can create a website that shows your listings and also allows agents or users to submit their listings. You can create submission offers and packages and earn money through it. The payments are facilitated by the PayPal. Villa Real is SEO friendly. Open house is a real estate theme. It is elegantly responsive and have a modern design. It has many useful features but is not hard to use. This theme has all the features you'll require to create a website. For example : advanced search features, showing nearby attraction spots, comparison, etc . It allows integration of Visual composer. So, you can create a website to display your real estate listings. This theme do not have front end submission features. So, it is best for simpler real estate websites for an agent. Skyestate is one of the WordPress themes for property listings in 2018. It is a feature rich theme to create a real estate directory where the agents as well as individuals can post. You can choose from the 5 homepage layouts. This theme facilitates the visitors with its advanced search feature. The front end submission part of the theme is highly flexible. The property submission form's custom fields can be updated as per your requirements. So, your visitors can add location aware listings after registration that will be shown on the google maps. It allows PayPal and Stripe integration. 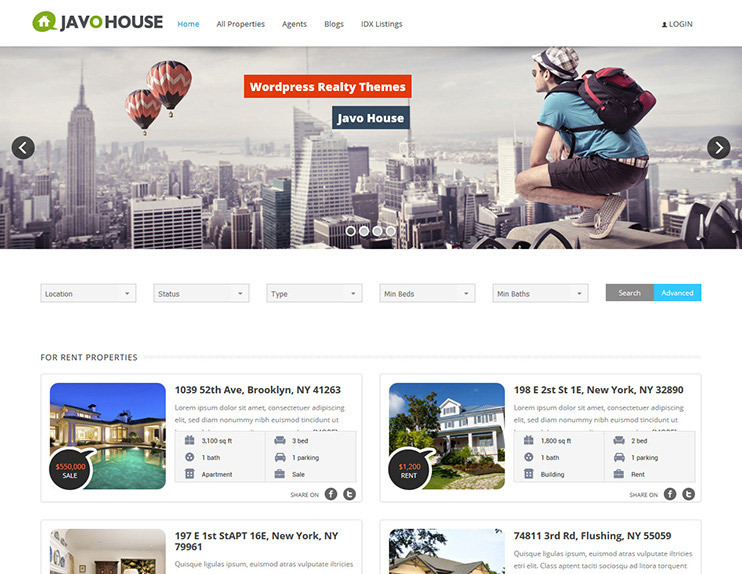 Javo house is a full featured theme for creating real estate WordPress websites. It has a clean and elegant design. The theme comes with abundant features and easy to use options. It has all the features like front end form management, Agent management, Google map integrations, etc. 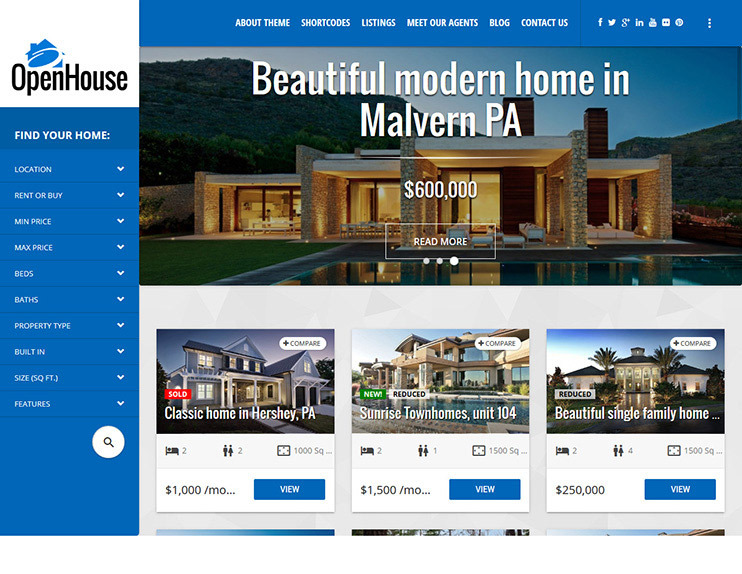 Javo house is for you if you want to create a straightforward, clean but feature packed website for your real estate business. 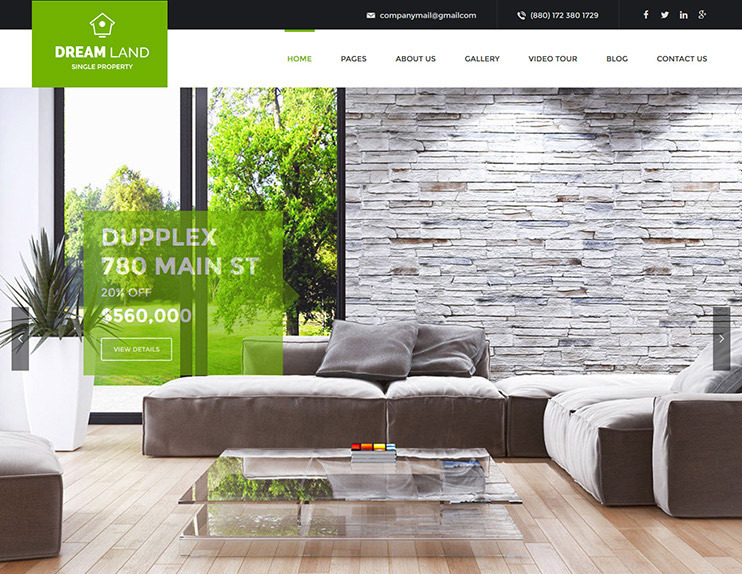 Dream Land is a single property WordPress real estate theme. With this theme you can create a website that advertises your property, house, apartment, etc. It comes with lots of pre designed pages that can facilitate your website building. You can create unlimited pages using the drag and drop visual composer page builder. It allows Events Calendar integration for showing events in your website. Everything in the website can be managed using the intuitive options available in admin panel. 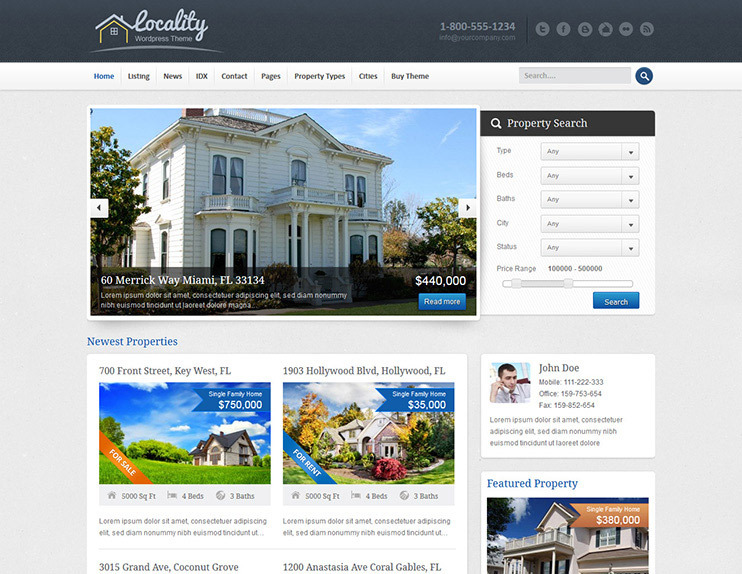 Locality is one of the WordPress themes for real estate. The theme is for listing real estate in the locality. 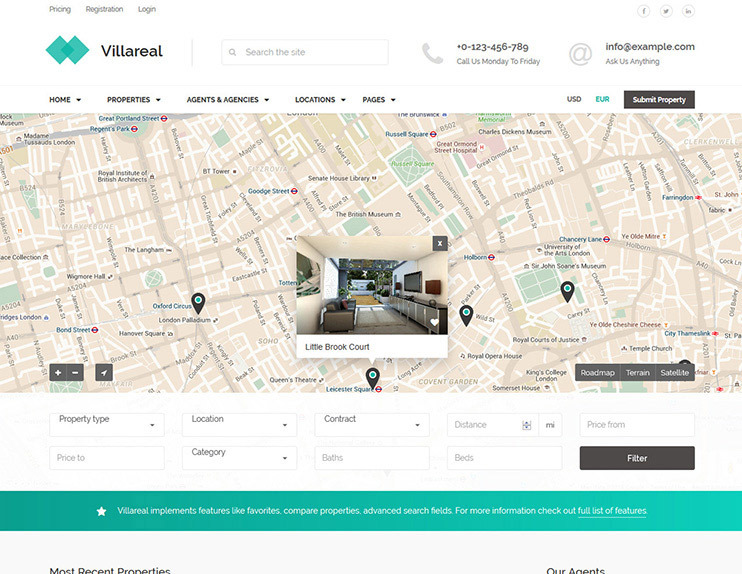 With this theme you can create a simple property listing website without the front end submission feature. If you want some of the properties to be highlighted you can set them as featured properties. It has the filtered search property. The theme also has the features to show related listings and agent page. You can manage everything with easy options. Agent Focused Pro estate agents listing theme. This theme is simple and designed to let you properly advertise your real estate listings. It lets you create a property broker website in just minutes. It allows famous plugins integration like AgentPress listings and IDX service. You can change the theme appearance with the theme customizer. With the theme options you can set how the theme behaves. You have widgets, layout options, header styles and many more options. All the themes of WPCasa are aimed at real estate WordPress website in 2018. 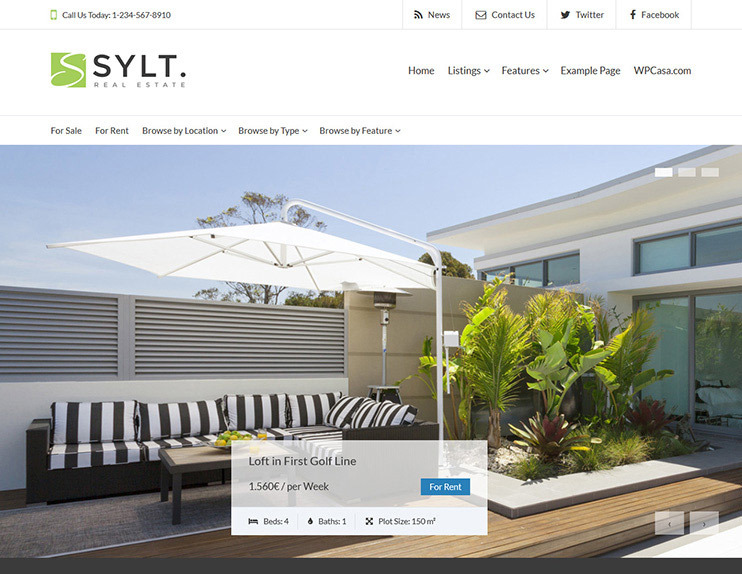 WPCASA syltis an SEO optimized WordPress theme for creating a property website. With this theme you can create a real estate listing website. The good thing about this theme is that it's features are provided in form of add-ons. So, if it's easy to get rid of a feature that you don't require. The very basic version of the theme can be downloaded for free. You can show your listings using listing slider or carousel. 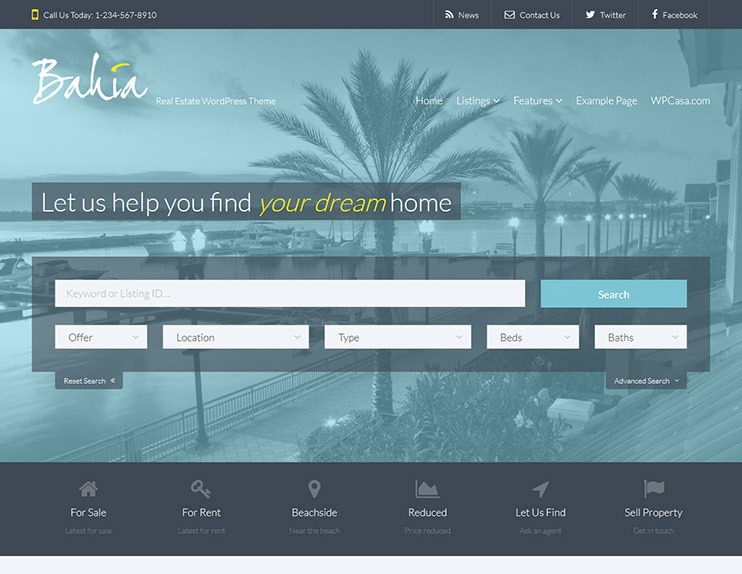 WP Casa Bahia is an easy to use real estate WordPress theme. It is fully SEO optimized and customizable. This theme is designed with beautiful presentation of the listings in mind. The theme lets you create image gallery and listing carousel. It has a beautiful advanced search feature. The listing page is totally widgetized. So, you can manage how you want your listing page to look. The features like add to favourites, listing labels, currency converter, etc are included with the theme. 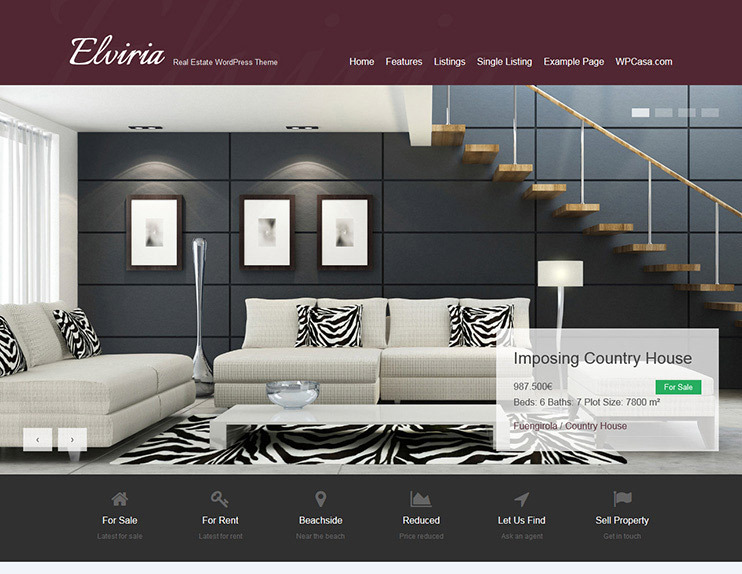 Elviria is a feature rich real estate WordPress theme from WPCASA. It can be used to create a website with real estate listings. Elviria lets you choose from 2 homepage templates. The listings can be shown with listing slider or listing carousel. The listing page is totally widgetized and hence, customizable. This theme is highly customizable. You can change how your website looks, very easily. Elviria is SEO optimized. With this theme you get some add-ons using which you can add to the features of the website. 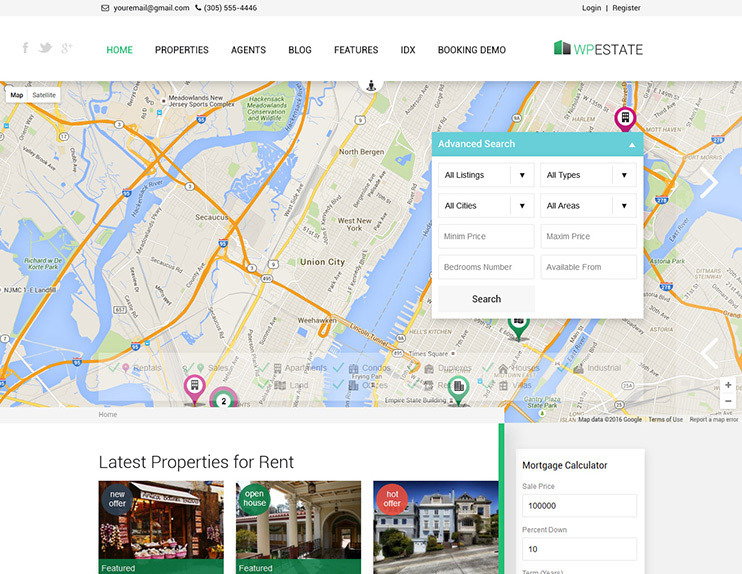 Estate engine is a property management theme. The theme comes with flexible and easy to use options to create your website. The theme allows you to manage content with the page builder. The theme lets you manage the page controls using the drag and drop options. Estate engine is SEO optimized. The front end submission and monetization options allows you to create a property portal. Elegant estate from elegant themes is an elegant theme! It is easy to use and flexible. With this theme you can create a real estate website with the easiest options, where you can display your listings. It has a clean, valid and secure code. With the theme options you can change how the theme looks and behaves. It comes with amazing page templates that are ready to use. This theme is a beautiful theme to show your real estate listings. 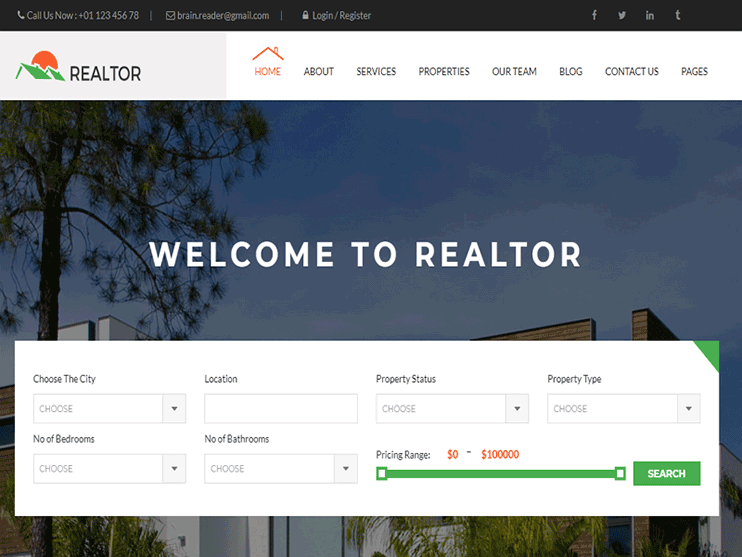 Realtor is a clean and minimal real estate WordPress theme. It can be used to create a property portal website where you can show the properties, and also allows property submission. The theme allows to show properties on the Google maps. There are two different property layout. The theme comes with agents listings, and agents details. The theme is SEO and speed optimized. 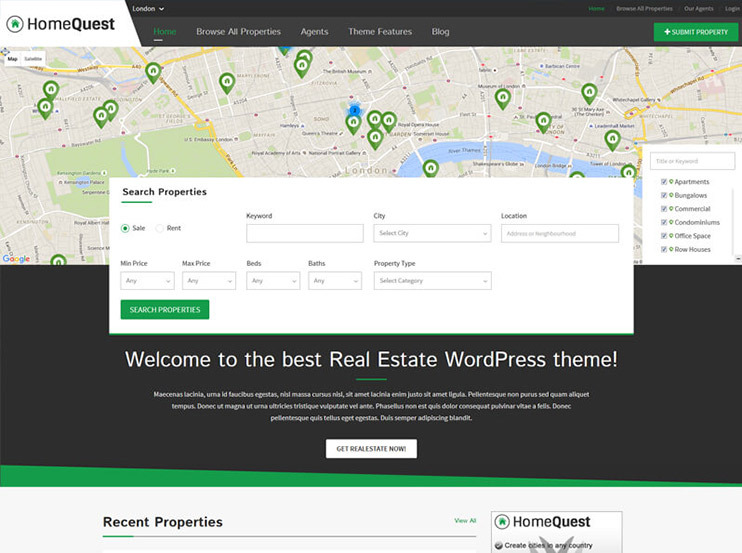 HomeQuest is a real estate WordPress theme. It is specifically designed to show the listing of homes. Your visitors will be the people searching the home. With the abundant customization options, you can change how your theme looks. There are many other options to manage the theme behaviour. It is SEO optimized. The genesis framework is a powerful framework from studiopress upon which you can create amazing websites. 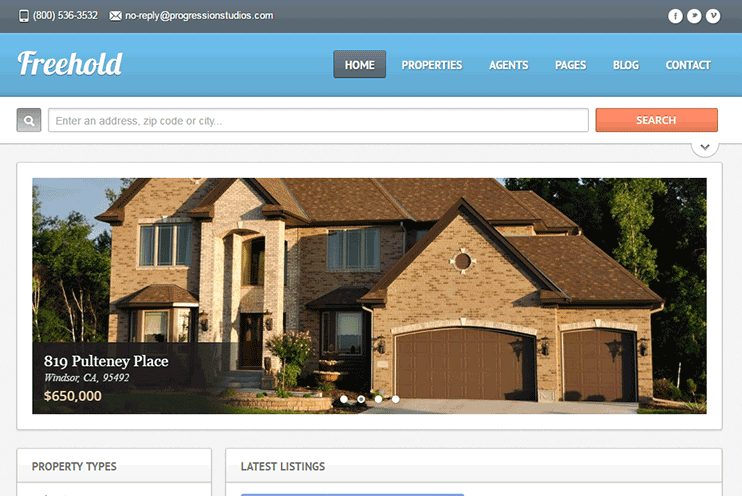 To create a real estate website, you can use the AgentPress pro WordPress theme. It is a multi featured theme that lets you create first class Real estate broker's website in minutes. Among its best features are the powerful features and the detailed listings for each property. You can use the AgentPress listings plugin for complete listing managements. It enabled you to complete manage the listings for representing the real estates on your website. You can add custom taxonomies to ensure that all the details are covered. 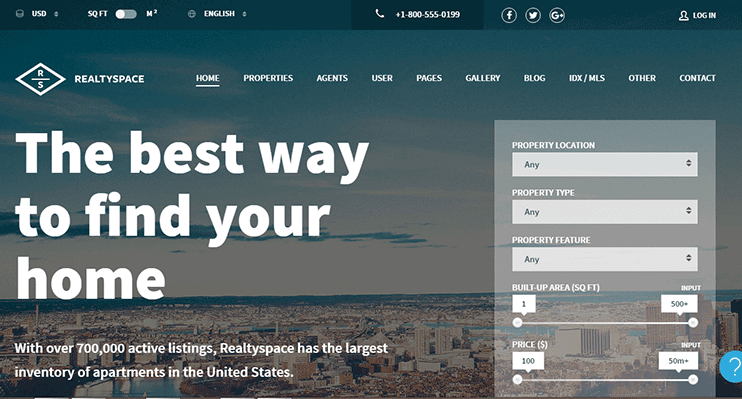 Easily customizable and highly mobile friendly, this theme is surely one of the most powerful systems to create your real estate listing website. 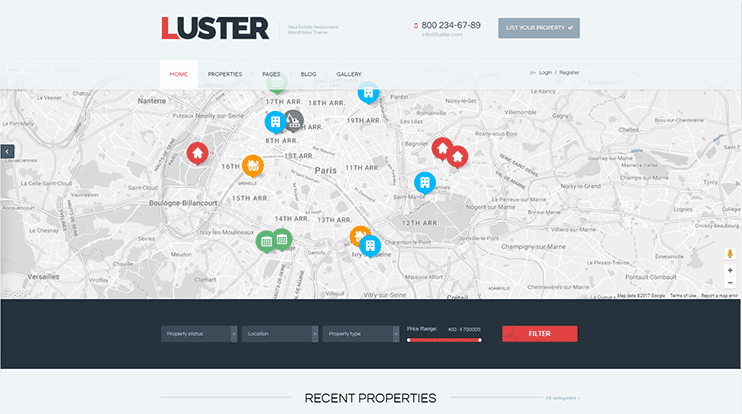 Luster is an idx ready WordPress real estate theme, with great and unique design. And you can choose from different luster demos - Luster main, Luster IDX, Luster Modern, Luster Vintage, Luster forest. Luster sea and Luster classic. All of these demos come with unique design, but the core features remain same, powerful. It allows you to allow front end submissions and collect payments with the integrated paypal. The custom post types like agents, agencies, etc. help you create more variation in your content and add and search the listings based on agents and agencies. 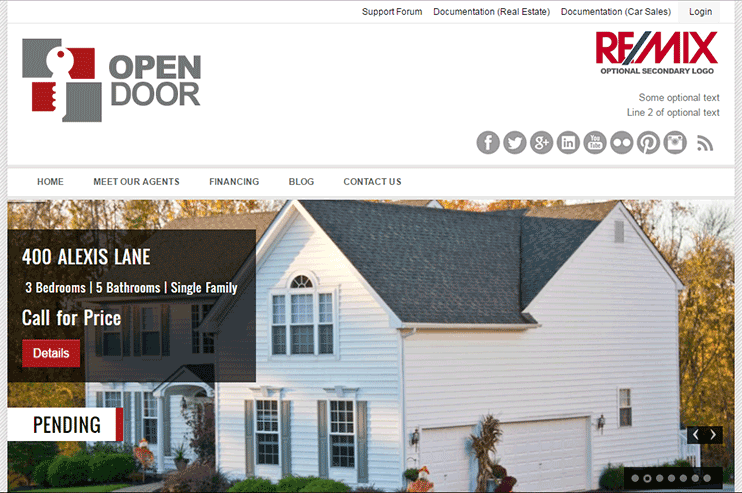 Open door is a sleek and feature focused, Real estate WordPress theme to let you create simple website easily and faster. 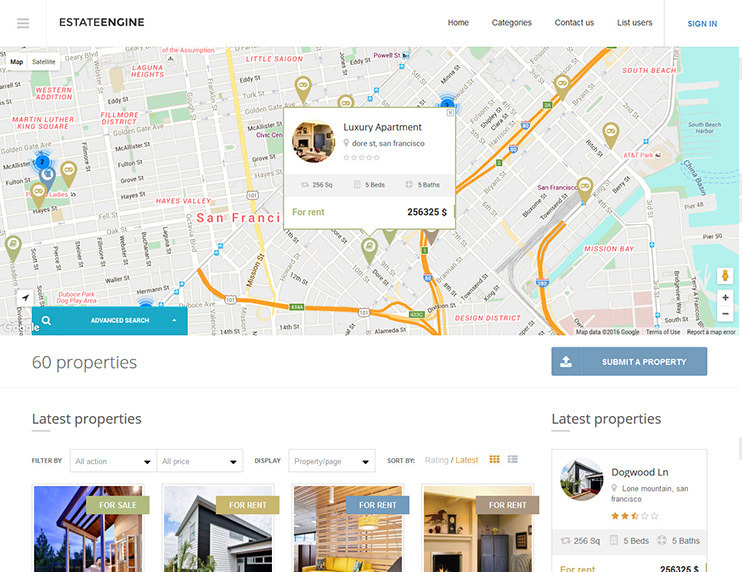 The best features of this theme are maps with street view, compare listing, and a very efficient search feature. The theme is elegantly responsive, so you won't have to worry about the size of visitor's device. The theme also comes with some utility features like a loan calculator, auto image resizing, translation files, etc. The customizable options are enough to make the basic changes into the appearance. The highlight of the theme is the CTA section that you can use to instigate user action. 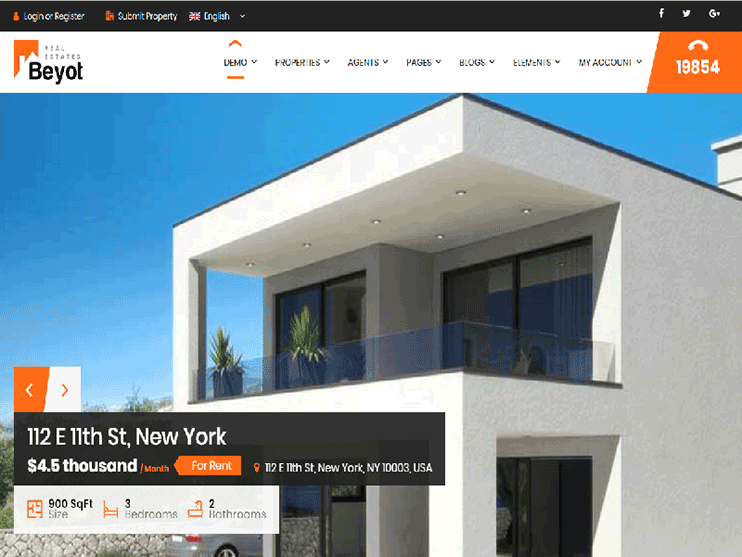 Sweethome is a beautiful, simple yet powerful RTL ready real estate theme for your WordPress website. The theme comes with a very powerful admin panel options, to let you manage and organize your real estate website. Search feature for a property listing website is important, and sweethome comes with the advanced search options. This makes it easy for the visitors to find the listings by filtering the results. WooCommerce compatibility makes it eCommerce ready. It is translation ready, and if you want to create your real estate website in RTL languages like Arabic or Hebrew, this theme allows you to do so. This theme is much more than a beautiful design. It has this range of well-designed and organized elements that add meaning to the purpose of your website. If you are a real estate agent or running a real estate agency, this theme is best for you to display all your properties. You get to choose from the 2 drag and drop page builders to re-organize your website. customization options are plenty, and easy. Things get easier with the shortcodes. The theme lets you create a website in any language, there are options to choose the currency, and unit areas. There are a lot more features, that you can know about by visiting the sales page of the theme. The theme also lets you create a multilingual Real estate website using the WPML plugin. 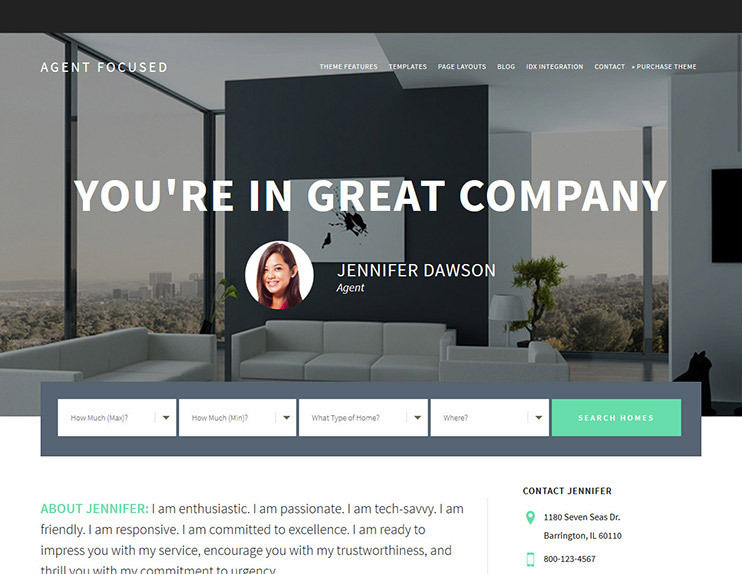 This responsive real estate WordPress theme is easy use and customize. With integrated custom google maps, your website can precisely describe the location of a property listed on your website. The search feature is worth appreciation. It makes it really easy for the visitors to find what they came for. For each property listings, you can add as many images as you want. Create a social media ready website with the Flickr and twitter widget. The theme comes with a ready to use contact form to instantly start getting the customer queries. 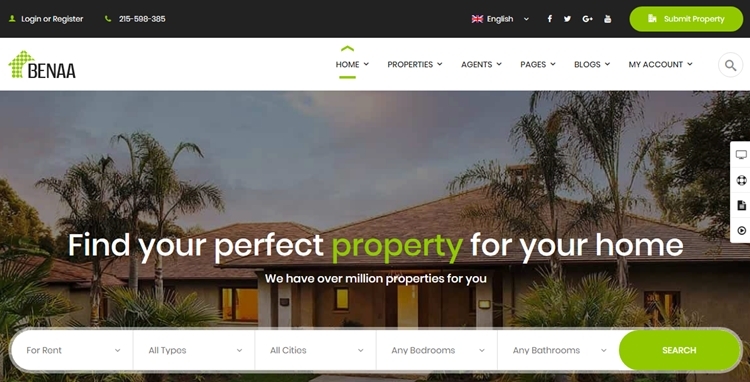 Real expert is the complete real estate WordPress theme that lets you create amazing property search websites. You can monetize your real estate website using the paid front end submission system. PayPal comes integrated so you can start accepting payments instantly. Choose from the 3 available homepage variation. This is an SEO friendly real estate theme, that comes with built in Google Analytics. The theme also allows advanced search so that visitors can search the listings. 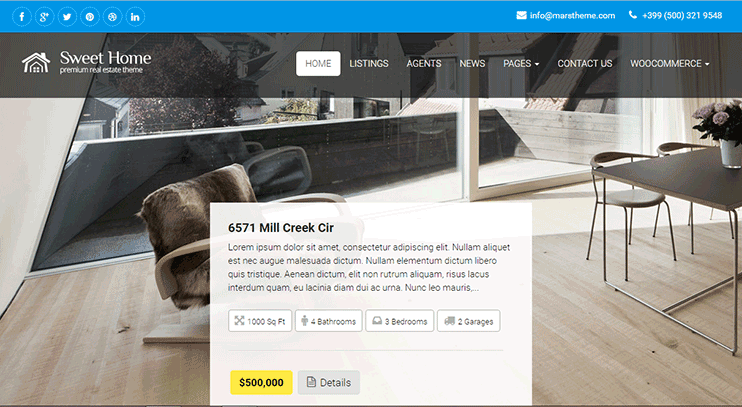 The Multilanguage ready real estate theme lets you create a website with multiple languages using WPML. Apartment WP is a responsive real estate WordPress theme for Realtors, agents, and property portals. The theme is as good for the single property site too. There are two homepage variations - One for creating single property website and the other for multi-listing property website. It lets your website allow paid front end submission. You can also use the dsIDXpress plugin into your website. With this theme you can create multilingual real estate websites too. 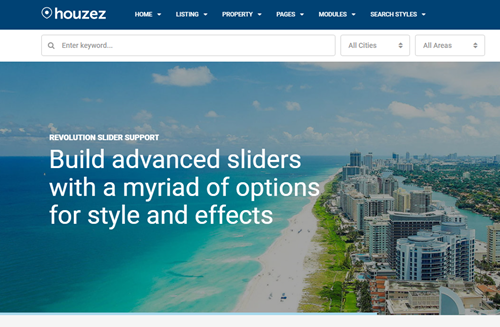 Houzez is a real estate WordPress theme property management system which allows you to own and maintain a real estate marketplace. 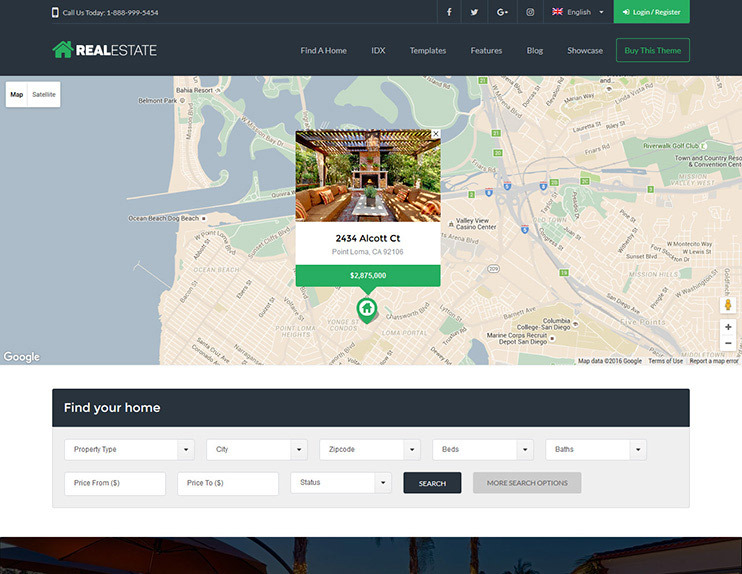 With this real estate theme, you can create a real estate directory to accept front end real estate listing submission and coordinate your agents. The theme is compatible with WPML and Visual Composer. You can show your property reviews and ratings and assign roles to new users. The WordPress property management theme comes with the features to review property, submit ratings and assign roles to new users. This Real Estate theme for WordPress comes with a Booking Calendar inbuilt. It also features a messaging system to send email alerts to the property agent. BEYOT is a simple and easy to use real estate based WordPress theme. These realtor’s theme is for real estate directory websites where agencies can submit their properties on your site. This real estate theme is responsive and compatible with Visual Composer plugin. Therefore, you can design your own pages and layouts as per your requirements. The real estate theme support email management system for alerts and notifications regarding the properties. Besides, there are many interesting features like support for multiple payment options and advanced search filters, etc. The theme is clean and easy to use and with one click install feature you can easily install the theme on your site. 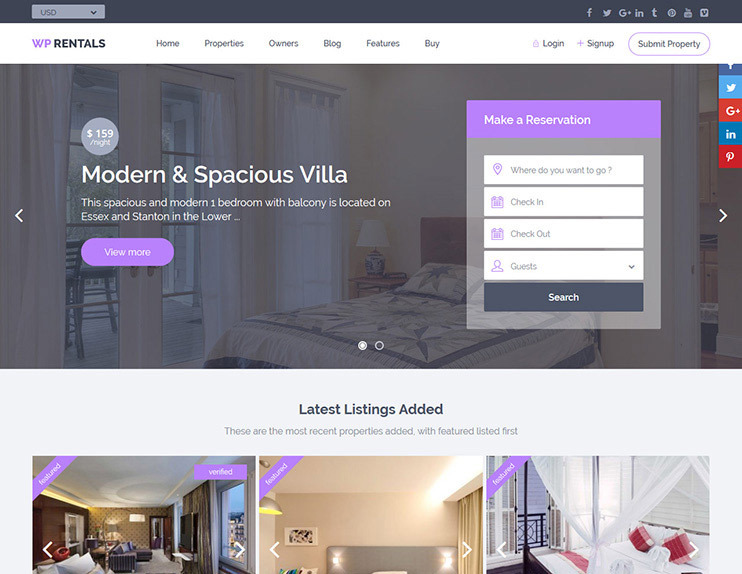 DreamVilla is a multi property WordPress theme with multiple homepage variations to choose from. Create responsive real estate websites compatible with Visual Composer drag and drop page builder. 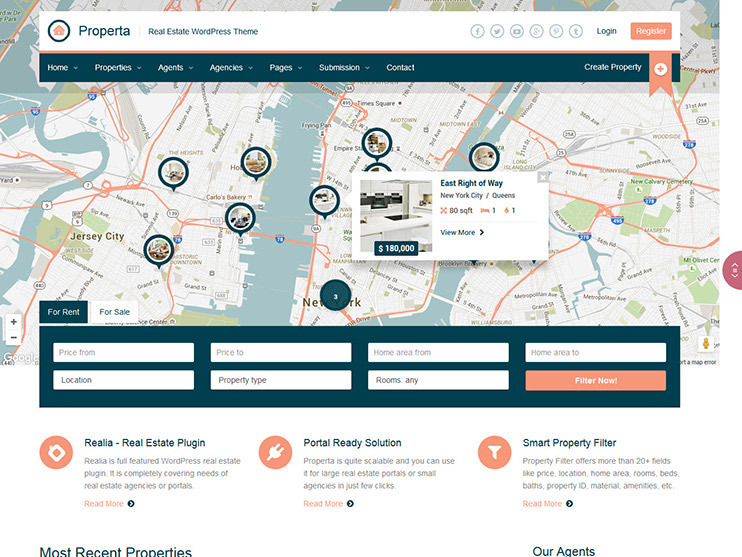 You can create a property listing real estate directory with front end submission using this theme. The users will be able to add properties on Google Maps or search for the properties already listed on the real estate website. DreamVilla comes with a fully functional mortgage calculator. So visitors can calculate mortgage amount and periods that they have to pay, without leaving your website. You can also make the submission as FREE and PAID submissions. Holdings Realty is a single property WordPress theme with drag and drop page building tools. This Property WordPress theme is easy to customize and you can easily build your site on your own. Holdings realty is responsive and comes with unlimited color customization options and google fonts.The theme has a built-in sticky header and mega menus. This real estate theme is translation ready and supports Contact Form 7 plugin. 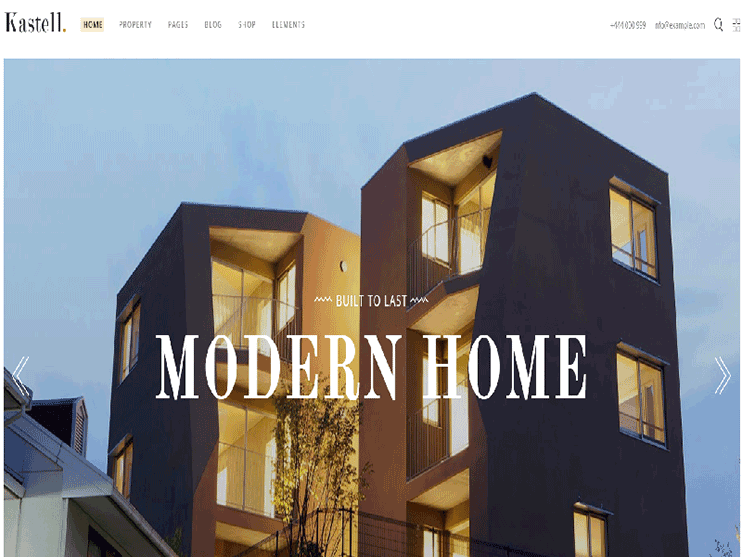 Kastell is a modern and elegant property WordPress theme. 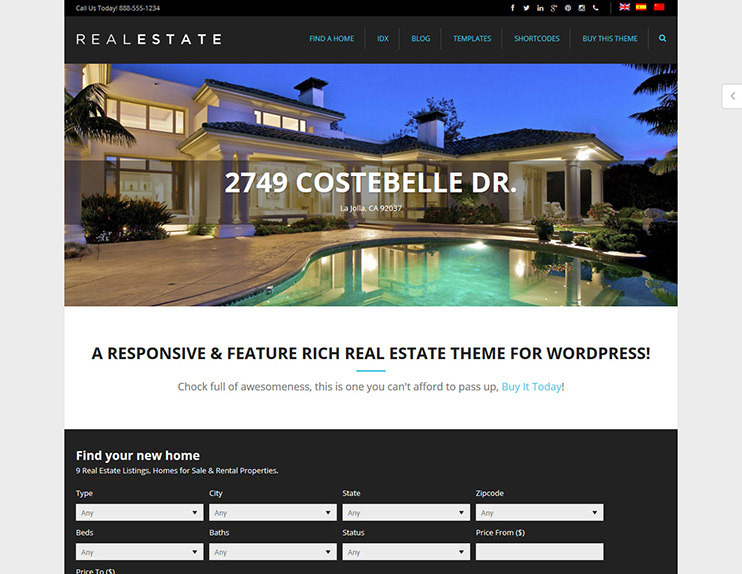 This real estate WordPress theme is highly customizable and easy to install. Kastell comes with multiple homepage design variations. Moreover, you can use the Visual Composer page builder for drag and drop web page building. 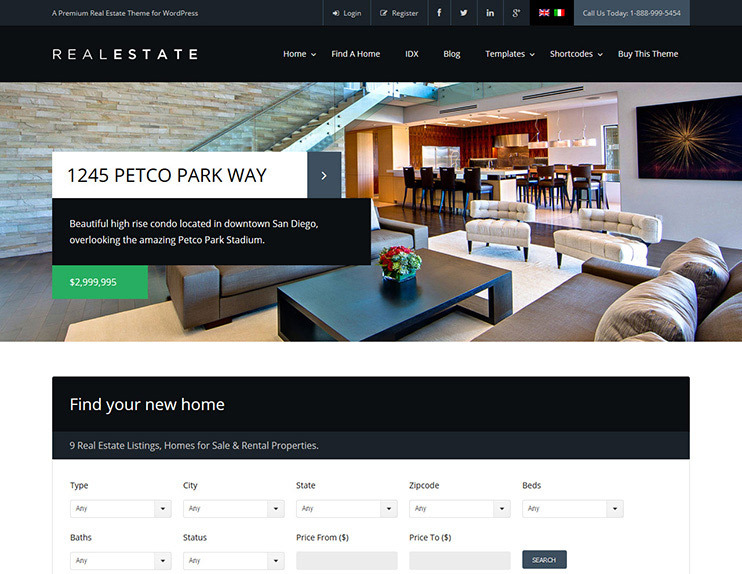 This real estate theme allows you to configure mega menus. It includes large collections of shortcodes to customize the layouts of your website and create unique design. 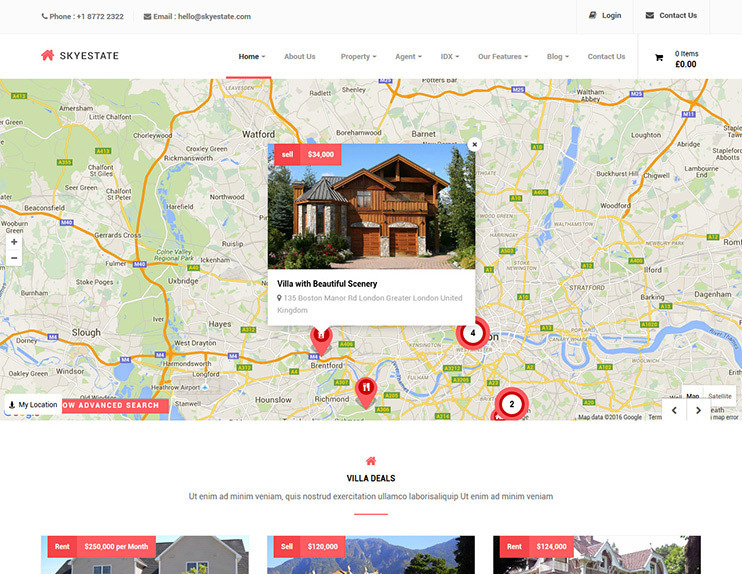 ReEstate is a property listing WordPress theme for agents,property brokers and builders. This real estate theme lets you create mobile friendly website in minutes. It comes with multiple homepage designs and other page layouts to choose from . The design of this real estate theme is modern and clean. It also includes features like inbuilt Google map integration and portfolio galleries. Realtor is a responsive and feature real estate theme to create WordPress real estate directories. 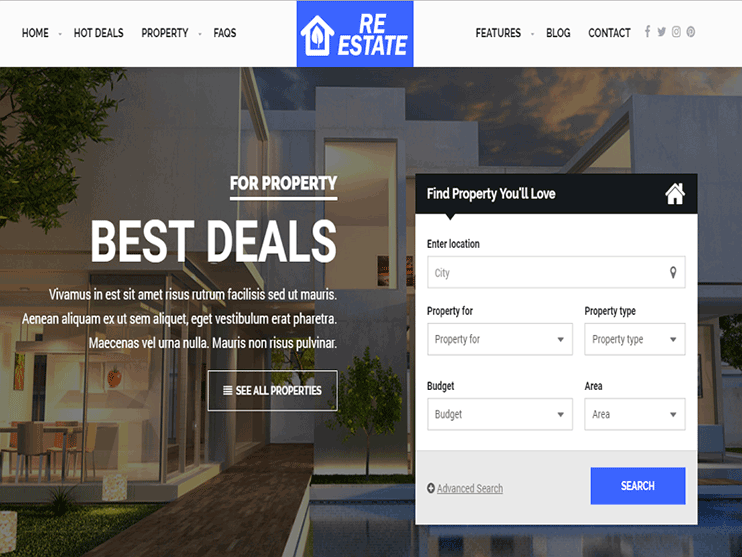 This real estate theme supports some of the best premium WordPress plugins like Visual composer, Slider Revolution and WPML. You can use the advance theme options to change how your website looks and works. 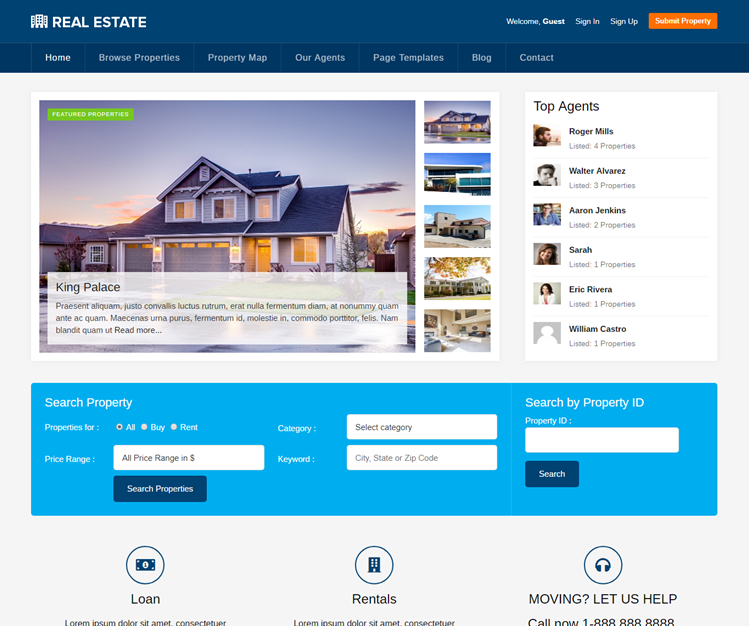 The realtor theme is easy to use and maintain. It includes a fully functional front end submission module. The property management theme has multiple homepage options so you can choose any design as per your requirements.